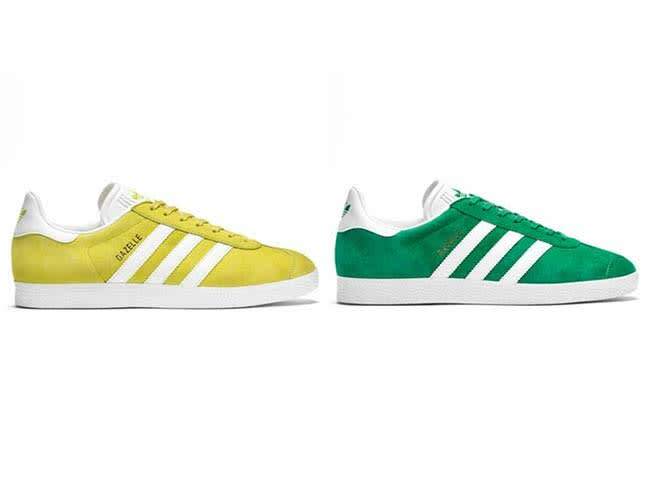 Kate Moss helps to relaunch iconic Adidas Gazelle trainers | HELLO! Adidas has enlisted Kate Moss to help relaunch one of its most iconic styles – the Gazelle trainer. The sportswear brand are hoping the classic suede trainers will gain cult status among the style set like Stan Smiths have over the past few years. The campaign uses an archive shot of Kate wearing the trainers back in 1993, when she was still a teenager. It has been turned into a video by digital artist Doug Abraham, who found fame with his cut-and-paste fashion imagery on Instagram. "Like the Gazelle, Kate Moss is just as relevant in 2016 as she was back in the 1990s, which is why the image works so well," Gary Aspden, an Adidas brand consultant, told Business of Fashion. "Kate told me earlier this year that when it comes to trainers she has always been an 'Adidias girl', so there was an affinity and an existing synergy there." Adidas Originals relaunched the Gazelle trainers in May with 12 bright suede shades including emerald green, lime and light blue. With their understated, timeless style they are sure to prove popular among fashion fans, much like the classic Stan Smith trainers have over the past couple of years. "We've had great success with [re-issuing] the Stan Smith and the Superstar," Nic Galway, vice president of global design at Adidas Originals said. "The original Gazelles were very slim and European. The 1993 Gazelle was a little bit bulkier, a little bit heavier and it's really iconic in the memory of that moment." Gazelle trainers are already popular among fashion bloggers and stylish celebs, with Rihanna, Alexa Chung and Rosie Huntington-Whiteley all previously spotted out and about in the cool, casual footwear. Kendall Jenner and Rihanna step out in same Ganni jacket - who wore it best? Fancy owning a pair of Kate Moss or Victoria Beckham's jeans?